The aims of this project were to map the location and density of gambling machines in Britain; to explore whether geographic areas with higher densities of machines exist and to examine the socio-economic characteristics of these areas relative to others. Using geospatial analysis of premises records, we identified 8861 Machine Zones which were areas with a 400 meter radius around gambling machine venue and 384 High Density Machine Zones (HDMZ) with 1 or more gambling machine per hectare. There was a significant correlation between machine density and socio-economic deprivation. HDMZs had greater levels of income deprivation, more economically inactive people and a younger age profile than other areas; 37 % of those living in HDMZs were economically inactive compared with 33 % of those in non-machine areas. HDMZs were in seaside locations but also New Towns or satellite towns to major urban areas. Area affluence explains some of this pattern; of the New Towns with HDMZs, 78 % were in New Towns with a high proportion of low income areas. We therefore concluded that the distribution of gambling machines in Great Britain, in line with other international jurisdictions, displays a significant association with areas of socio-economic deprivation. The profile of the resident population living in HDMZs mirrors the profile of those most at-risk of experiencing harm from gambling. This spatial pattern has important implications for assessing the relationship between gambling availability and gambling-related harm, and for the future development of policy, harm-prevention and treatment strategies. 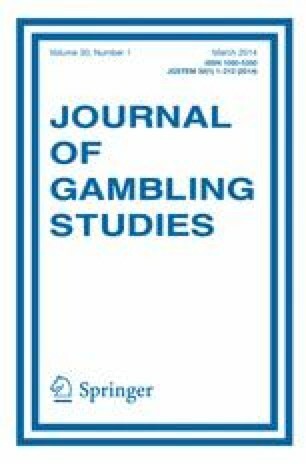 We wish to acknowledge the support of the Responsible Gambling Fund who sponsored a program of research into gambling machines in Britain, of which the work reported in this paper was part. Heather Wardle and NatCen has received funding for a number of research projects from the Responsible Gambling Fund, a charitable body who funds its research programme based on donations from the gambling industry. NatCen has also undertaken work for an online gambling company to help them improve their social responsibility practice. Ruth Keily and Gaynor Astbury have received funding from the Responsible Gambling Fund as well as other commercial clients not related to the gambling industry. Gerda Reith has received joint funding from the Responsible Gambling Fund and the ESRC. She is also a member of the Responsible Gambling Strategy Board which advises the Responsible Gambling Fund about research issues. Chuang, Y. C., Cubbin, C., Ahn, D., Winkleby, M. A. (2005). Effects of neighbourhood socioeconomic status and convenience store concentration on individual level smoking. Journal of Epidemiology and Community Health, doi: 10.1136/jech.2004.029041. GamCare. (2010). Statistics 2009/2010. http://www.gamcare.org.uk/publications.php. Accessed 27 March 2012. Harman, H. (2011). The problem of betting shops blighting our high street. http://www.harrietharman.org/uploads/d2535bc1-c54e-6114-a910-cce7a3eff966.pdf. Accessed 25 Jan 2012. Robitaille, E., & Herjean, P. (2008). An analysis of the accessibility of video lottery terminals: The case on Montreal. International Journal of Health Geographics. doi: 10.1186/1476-072X-7-2.